Surely the headline question has many aspects, and a short post can't take the mission of answering it correctly. Yet I am going to look into one quite recent paper published by Chomsky and three of his followers, to find out that the Chomskyan school is wrong in the most basics of language. The paper is titled "How could language have evolved?" It seems to propose some of the important failures of the Chomskyan theory. Take the use they do with "faculty of language". Is there a department - which is the meaning of "faculty" - of language in the human body, brain, or elsewhere? why no one other than the Chomskyans speaks of any "faculty" in the human sciences? The answer is quite simple. No one other than Chomsky regards language as a department. Rather it is regarded as a collective name of fitness and capability of producing meaningful patterns by voice, writing or signing. The common perception of language shared by most people and most non Chomskyan scholars is of the competence of performing acts that create meanings. If anyone is asked why one speaks, the answer would be something like "I want to say something", which can be translated to " I want to express a meaning that other will receive". All that has nothing to do with faculties, departments, offices. To speak is to perform acts that their principle lines and stages of execution are not different from any other act executed by human or by any animal. So according to their definition, we never say anything about reality, about the world, what we do, see, think. What does one do when language is performed? One makes hierarchical syntactic structure. What components build this Hierarchical structure up? Are there words? Or what else could there be? Everyone in the world except a Chomskyn would say "words". This word does not appear in this paper. As the smart four gang were discussing which term to use for the elements needed to build up their "hierarchical syntactic structure", the alleged "core" of language, they started invalidating "word". Such a simple common and clear term is unacceptable when a highly sophisticated paper is tuned for the sage and the wise. And they came up with "conceptual atoms of the lexicon". The word "lexicon" suggests they meant "words". The reason they used such an awkward phrase is the consistent tendency of the Chomskyan school to minimize the importance of the meaning in language. As long as meaning is but a marginal, side effect of language, "conceptual atoms of the lexicon", they can stick to the mystique belief that there is nothing more important than syntax. And flying on their mystique, they conclude that there is little to study about the evolution of language, as allegedly Syntax came ready some 70-100 millennia ago through genetics and did not change since. At these assertions lies the greatest failure of Chomsky. What is at stake in language, in linguistics, is meaning creating, not syntax. Meanings are carried by words, first of all by words. Syntax is a tool of editing the many meanings that words suggest to one comprehensive meaning. By no means can syntax be treated independently of the meanings that words have. Back to my main subject, the evolution of language, the great failure of the above Chomskyan article is their absolute blindness to the importance of words, the importance of humans being able to pronounce the words, and therefore the main task of the research of language evolution: find out and describe how a chimpanzee-like ape shaped itself anew time after time again and again to become a speeker of endless meanings. 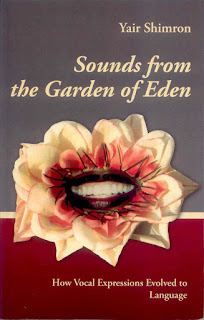 This is what I have done in my book "Sounds from the Garden of Eden", shown below. You can have it from Amazon. The third chapter of my book "Sounds from the Garden of Eden" discusses the theme of language relations. The common, widely accepted theory tells us that almost every language is a part of a family of languages. Like, for instance, English belongs to the Germanic family, which by itself is a part of the Indo-European family. Every student of linguistics or anything that has to do with languages studies this theory as if it were an absolute truth. The theory of language family was invented two hundred years ago to be applied to the language families then known, the Indo European and Semitic. 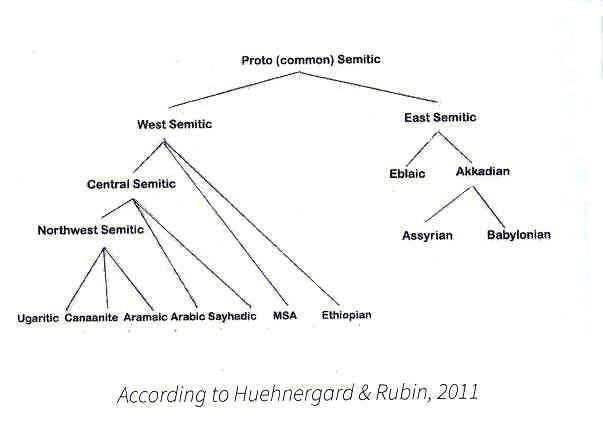 later all languages of the world were assembled in families, and also in macro families, like the Afro Asiatic which connects 6 different families of languages, 5 from Africa, and the Semitic. This blog is dedicated to a new, absolutely new way of accounting for the evolution of language. The former posts gave the readers first clues to my attitude to language evolution. Here I show the book's table of contents. All three chapters, and especially the second take different roots in explaining the developments of human evolution and language evolution. This blog will bring a new way of thinking of and theorizing the subject of the origin and evolution of language. The blog is based on the content of the new book shown above. When I started thinking about language evolution, I asked myself what could be said for granted about the subject. And three things came up: the first were the languages spoken today, which are quite well known and described. The second was the first evidence of written languages of 5 thousands year ago, ancient Egyptian and Sumerian, of which what is most important for us is the fact that they were in many aspects very much similar to modern languages. The third sure fact that I could point out were...the voices of monkeys and apes.